New York, January 5 — The 37th Annual Thurman Munson Awards Dinner, which remembers the late, great Yankees captain and catcher, will be presented at the Grand Hyatt Hotel in New York City on Tuesday night, February 7, 2017, and the honorees announced today are: fan favorite New York Mets infielder Wilmer Flores, New York Yankees rookie catcher Gary Sanchez, and New York Football Giants Super Bowl champion wide receiver Victor Cruz. The AHRC New York City Foundation, which assists children and adults with disabilities, benefits from the gala. Michael Kay, the "Voice of the Yankees" on YES Network and ESPN NY Radio 98.7 FM host, will serve as Master of Ceremonies. For tickets and information on the Munson Awards Dinner call 212-249-6188 or email jennifer@emgbenefits.com. Tickets may be purchased on line at www.ahrcNYCfoundation.org/events. The AHRC New York City Foundation is a not-for-profit organization that supports programs enabling children and adults with intellectual and developmental disabilities to lead richer, more productive lives, including programs of AHRC New York City. AHRC New York City is one of the largest organizations of its kind, serving 15,000 children and adults who have intellectual and developmental disabilities, including autism, cerebral palsy, traumatic brain injuries and other disabilities. 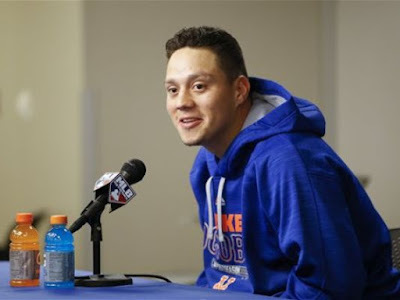 Signed by the Mets as an International Free Agent in 2007 on his 16th birthday, Flores has flourished with 16 home runs in each of the last two campaigns as a versatile infield contributor on the pair of Mets playoff-bound squads including the National League Championships in 2015. The Venezuelan native, who has played all four infield positions for New York, was promoted to the Mets in 2013 on his 22nd birthday after hitting .321 with 15 home runs with AAA Las Vegas. Flores became a fan favorite in 2015 when he showed visible emotion on the field after rumors circulated Citi Field that he had been traded. He hit a torrid .343 after the failed trade to Milwaukee, a barrage that included a walk off home run against the Nationals that put the Mets within two games of first place. Active in the community through the Mets Foundation, Flores has celebrated Major League Baseball’s Play Ball initiative with a kids' clinic; supported the Ronald McDonald House Charities at its annual golf outing; hosted another baseball clinic for Port St. Lucie Special Olympics; and has honored the military through various Mets programs. Sanchez hit the American League by storm in just two short months on the Yankees roster, clouting 20 home runs with 42 RBI in 53 games. On August 23rd, the native of Santo Domingo became the first Yankees catcher since Thurman Munson (July 1976) to be named AL Player of the Week when he hit .523 with four home runs, six RBI, four runs scored and a stolen base in six games. The 23-year-old backstop then underlined his epic start with both Player of the Month and Rookie of the Month honors in August when he hit .389 with 11 home runs, nine doubles and 21 RBIs in 24 games after being recalled from Triple-A Scranton/Wilkes-Barre on Aug. 3. A neophyte in the majors, Sanchez has been active in the Yankee organization’s “Hope Week” initiatives on the minor league level. Signed by the Mets as an International Free Agent in 2007 on his 16th birthday, the native of Venezuela has flourished with 16 home runs in each of the last two campaigns as a versatile infield contributor on the pair of Mets playoff-bound squads including the National League Championships in 2015. Flores, who has played all four infield positions for New York, was promoted to the Mets in 2013 on his 22nd birthday after hitting .321 with 15 home runs with AAA Las Vegas. Flores became a fan favorite in 2015 when he showed visible emotion on the field after rumors circulated Citi Field that he had been traded. He hit a torrid .343 after the failed trade to Milwaukee, a barrage that included a walk off home run against the Nationals that put the Mets within two games of first place. A member of the Giants Super Bowl championship team in 2012, wide receiver Victor Cruz grew up in Paterson, NJ in the shadows of the Giants’ home field at MetLife Stadium, and football was always his first love. He was an all-state receiver for Paterson Catholic High School and went on to win a State Championship with the Cougars. After graduating from high school, Victor accepted a scholarship to the University of Massachusetts where he earned more athletic accolades and was ranked as high as 13th in the NCAA for receiving yards per game. As an undrafted free agent in 2010, Victor impressively played his way onto the Giants’ 53-man regular season roster. By the end of the 2011 season, he finished with a single-season franchise record for receiving yards and was named second-team All-Pro by the Associated Press. He enjoyed back-to-back 80-plus receptions seasons in ’11 and ’12. Victor also tied an NFL record for the longest play with a 99-yard touchdown reception and was an integral part of the Giants Super Bowl victory over the Patriots. The following year, he earned a selection to the 2012 Pro Bowl as he continued to establish himself as a premier NFL player. Cruz has made it all the way back from a severe knee injury which forced him to miss the entire 2015 season. Off the field, Cruz has devoted his time to numerous causes and is an active philanthropist. He created the Victor Cruz Foundation in 2012, which provides a full array of support for youth to achieve success in the workforce and life. Focusing on S.T.E.M (science, technology, engineering and math) the Victor Cruz Foundation partnered with Time Warner Cable’s Connect a Million Minds and the Boys and Girls Club of America in 2013 to help implement the first ever S.T.E.M curriculum in 10 clubs across the northeast through DIY STEM. The Victor Cruz Foundation is committed to continued research and partnerships with educators and S.T.E.M programs to help encourage and impact today’s youth.